The West Central Blogger: Pine to Prairie--and Back Again. 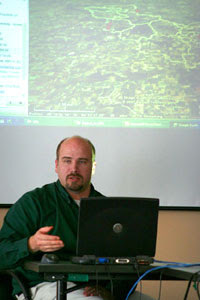 The Pine to Prairie GIS (Geographic Information Systems) User Group met at West Central Initiative on March 7. This group of GIS professionals and users meet on a quarterly basis to learn some new GIS practices, discuss topics of interest and network with other GIS users in the region. WCI hosts meetings and provides a grant to the group to cover the cost of web site hosting and some of the meeting expenses. For more information, about the group, visit its Web site.